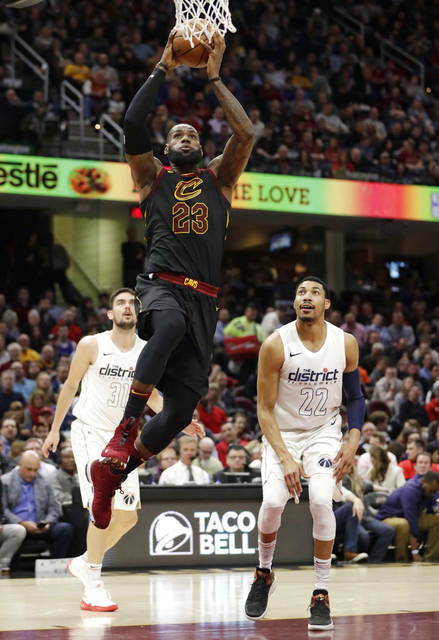 CLEVELAND — Bradley Beal scored 18 points, Kelly Oubre Jr. added 17 and tried to untie the sneakers of one of Cleveland’s new players, and the Washington Wizards withstood a late assault by LeBron James to beat the new-look Cavaliers 110-103 on Thursday night. Wizards: Coach Scott Brooks would not confirm reports Washington will sign veteran G Ramon Sessions to a 10-day contract. He was released by New York last month. Washington has been playing without Wall, who had surgery on his left knee in late January and could be out until the playoffs. The 31-year-old Sessions served as Wall’s backup from 2014-16. … Brooks said the All-Star break helped several players rest injuries. G Tim Frazier returned after missing the final game before the All-Star break after sustaining a nasal fracture on Feb. 10. Cavaliers: Smith’s recent fast starts have been a key to Cleveland’s success. Smith is shooting 18 of 21 — 14 of 15 from the 3-point range — in the first quarter of the past six games. “When he’s making shots,” said coach Tyronn Lue, “we’re a different team.” … James became the seventh player with 11,000 career field goals. … The trades brought an infusion of youth to what was the league’s oldest roster. “It’s not an old team anymore,” Lue said. “We’ve definitely gotten younger.” … Signed G Marcus Thornton to a 10-day contract. Wizards: Host Charlotte on Friday. Cavaliers: At Memphis on Friday.